I always do my Shabbat grocery shopping on Wednesday because supermarkets in Israel are beyond crazy on Thursdays. It’s sort of like 6 AM on Black Friday at an outlet mall in the US, but every single week, without fail. There are hundreds of people and so many shopping carts it’s like trying to navigate a minefield, if the mines were on wheels and being pushed around by aggressively anxious suburbanites. Even if you brave the shopping aisles, the checkout lines are longer then the lines at Disneyland. You couldn’t pay me enough to go on a Thursday, even if I happen to forget or can’t go on a Wednesday, I would rather go last minute on Friday without the hassle. When I was in the supermarket tonight getting Shabbat groceries, I checked out the fish counter and saw salmon for a great price! What a score! And just like that, dinner was figured out. Well, at least the protein part. I (politely as possible) asked the guy behind the counter if he could take off the skin (it really grosses me out) and he came back with all the gray gunk still attached so I asked even more sweetly if he could get more of it off. I walked out of there with a perfectly cleaned salmon. Double score! After getting home and putting all the groceries away, I wanted something simple and clean so I put some wild rice to boil and roasted some veggies. Easiest dinner ever. I decided to mix it up with the salmon and come up with something entirely new and believe me when I say this, it was out of this world! I have the exact measurements of this sauce for you guys, but I did kinda lose track of the baking time and I figure that’s not a huge deal though because people like their salmon done to different levels, so bake to your taste! Lay salmon on a aluminum covered baking sheet. Whisk together from the garlic to the crushed red pepper. Pour over the salmon, making sure to cover everything. Sprinkle season seeds and freshly cracked black pepper on top. Bake at 350 F for around 12-20 minutes, depending how you like your salmon. 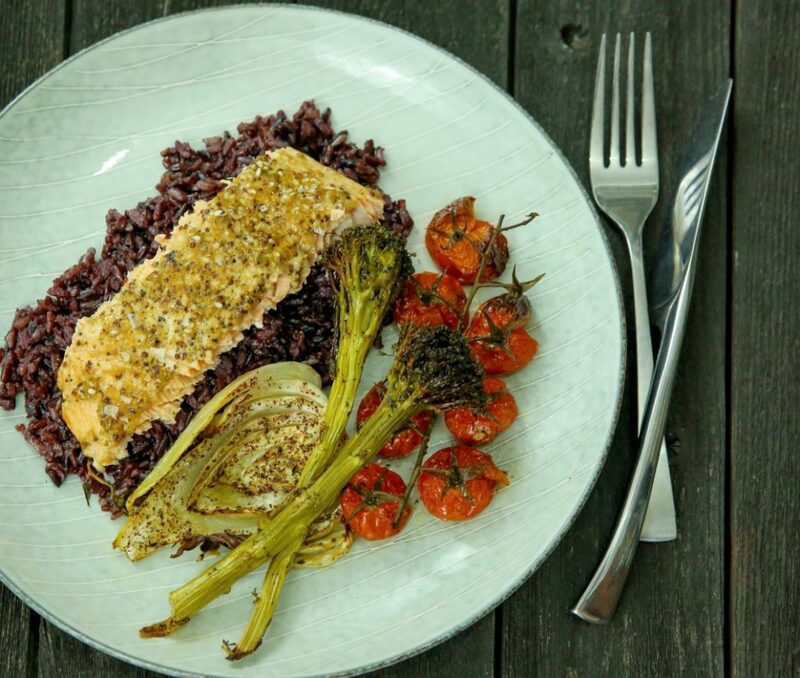 Serve over a bed of wild rice with roasted broccolini, fennel and tomatoes on the vine: Drizzle with good olive oil and season with coarse sea salt, sumac, oregano and freshly cracked black pepper. Roast at 400 F for 40 minutes or until blistered.